I was out of town this past weekend (in Chicago) but I heard the weather finally cleared up and is nice now. I hope that's the case because it's about time it warmed up here. Speaking of warming up, if you're looking for an excuse to be outside, an excuse that's a really good cause, there's an MS training walk coming up in a couple of weeks to help you get ready for the real thing this Fall. 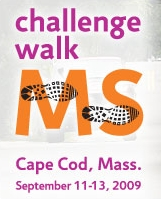 This September 11-13 on Cape Cod, the Central New England chapter of the National Multiple Sclerosis Society will host the annual MS Challenge Walk, walking three days and 50 miles to raise money for and awareness of multiple sclerosis. To help get you in shape, join us for this training walk along the Charles River. Radio station Mix 98.5 will be sponsoring this event and giving out goodies to all participants. I wonder if Karson and Kennedy will be there? Me and them go wayyyy back. Ok not really, but I did get to meet and chat with them at an Intercontinental event a couple months back (here). Click (here) for more info on the walk. 0 Response to "MS Challenge Walk Training Walk - 7/25"